It’s the Last Day for January Promos at DontCrack ! Audified MixChecker and MixChecker Pro up to 65% Off Here ! 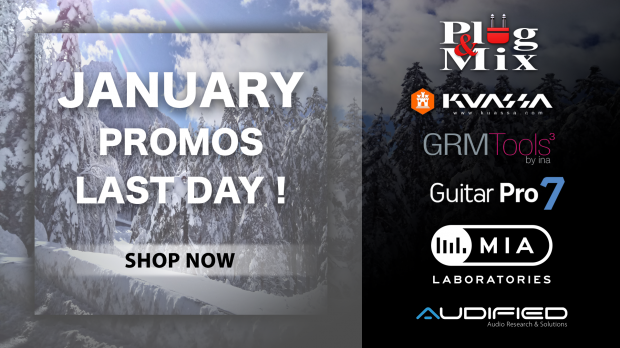 Kuassa’s Guitar Amps and FX Plug-ins up to 65% Off Here ! MIA Laboaratories’ incredible EQ Plug-ins at up to 72% Off Here ! Get INA ‘GRM Tools Spaces’ at 70% Off Here ! Plug And Mix ‘Pro Series’ Bundle at 70% Off ! Arobas Music’s Guitar Pro 7.5 is Only $59 Here ! This entry was posted in DontCrack, Plug-ins, Promotions and tagged Arobas Guitar Pro, GRM Spaces, January Promos, Kuassa, MIA LABS, MixChecker, P&M Pro Series. Bookmark the permalink.